The devastation delivered to people in the mid-Florida Panhandle by Michael is still very evident if you look around our area. Cleanup in Franklin County has been amazingly rapid as citizens and local governments work to restore a sense of normalcy. Things are looking much better, but many people still have a long road to full recovery. Especially if they lived closer to where the center of this monstrous storm made landfall and tracked inland. I was stunned recently, as I drove to LaGrange (just SW of Atlanta) for a meeting and witnessed first-hand the vast scale of serious damage that Michael left in it’s wake. North of Colquitt, I was still seeing forests with 50+ percent of their pine trees snapped off. And the pecan groves were wrecked; with giant piles of trees and limbs pushed up to burn at a later date. In the Flint River Basin of SW Georgia, center-pivot irrigation rigs were blown over in the fields. I wouldn’t think there was enough surface area on pipes like this to blow them over but when you have winds of 102 mph (measured at the Marianna Airport) reaching so far inland, many unexpected things happen. This was the first category 3 storm to hit Georgia since 1898. Michael lacked only 3mph from being a category five storm when it came ashore near Mexico Beach. The loss of human life and property are of course the first things on our minds with events like this and as the shock wears off we can begin to assess other aspects, such as damage to our natural ecosystems. Coastal barrier dune habitats were another significant casualty of this hurricane. Franklin, Gulf and Bay County host about 124 miles of Gulf-facing barrier beach systems. Tremendous losses were incurred, and this storm totally reshaped many portions of the mid-Panhandle coastline. 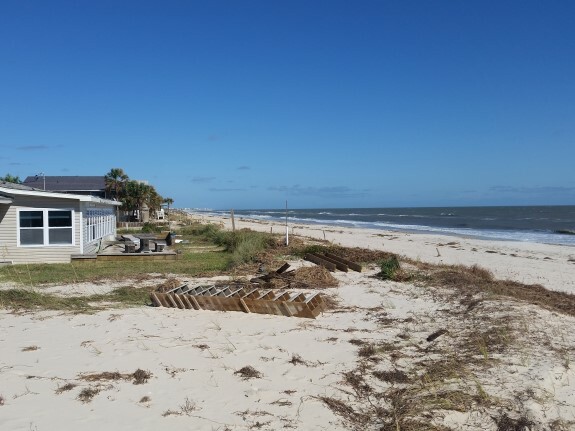 This situation leaves coastal property owners wondering about the practical and legal aspects of dune restoration. How to do it; where to get plants and sand fencing; what local, state or federal agencies are involved; when approval is required; is funding available; these are just some of the questions that come to mind. It is a complex issue that requires some expertise to tackle properly. To be totally transparent, I have not been involved in dune restoration, personally. Therefore, the information provided here comes from digging for resources from others with more expertise. One great publication from UF/IFAS and Florida Sea Grant that recently came out can be found in our EDIS documents at this address: http://edis.ifas.ufl.edu/pdffiles/SG/SG15600.pdf. It provides contact information, how-to guidelines, plant species information, and planting configurations that provide the best opportunity for success. The Florida Legislature adopted the Florida Beaches and Shores Preservation Act, which established the Coastal Construction Control Line (CCCL) Program. Any activity seaward of the CCCL requires a review from the Florida Department of Environmental Protection (FDEP) to determine if a permit or oversight is needed. FDEP also has staff who can answer other questions related you your dune restoration needs. They even have programs with staff who work with local governments for cost-share and review on restoration projects. All dune restoration work must also consider the possibility of protected species in the area. For example, sea turtles or beach mice might need to be figured into the mix. The US Fish and Wildlife Service or the Fish and Wildlife Conservation Commission may also be involved in project oversight or design considerations. And don’t forget to check with your local county planning and zoning or other permitting entity for any local requirements. In the end, we had an estimated 2,725 major structures within the coastal building zone that sustained major damage, from Wakulla through Bay County. Time, along with a lot of hard work, will eventually push this storm farther down memory lane for most people; and time will also heal many of the scars made on our native coastal barrier beaches in the mid-Florida Panhandle. These dynamic ecosystems have survived in a world of give and take from time immemorial. Franklin County Extension Director and Regional Specialized Sea Grant Agent.